The mat’s surface is made with a premium fiber which is designed not to crease when folding. The bottom is made with a PET non-slip resin. Your putt mat should always have a sticky bottom so it doesn’t slide on smooth surfaces. The non-slip bottom is to ensure safety when standing on the mat. It also has a foam strip where the holes are situated that creates a slight incline. The Putt-A-Bout putting green area measures at 11ft in length and 36″ wide. It’s recommended that putt training aids should have at least a 10ft distance to practice your putting stroke more effectively. That makes this one a very dynamic design. The bean shape is designed to give you more of a challenge when practicing your stroke. You can do this by changing your angles when putting. The Putt-A-Bout comes with two removable putting cups that aid you with your accuracy, ring height and slopes. The cups provide training for different types of putt speed. It helps you judge how hard or soft to hit the ball. The Putt-A-Bout is a mat that represents a mini-golf course. It’s a portable indoor training course that aids you in improving your putt stroke. The Putt-A-Bout indoor green is fully portable so you can take it with you wherever you go. You can set it up in your office to play a leisurely round during lunch breaks. You can also set it up in your back yard or even your living room. All you have to do is roll the mat out wherever you are and start putting. It’s so easy that you may never have to visit the golf course again to practice your putt strokes. The Putt-A-Bout is designed to train novice and professional golfers. Here we’ll give you a few reasons the Putt-A-Bout can benefit you. Training at a course can improve your golfing but the Putt-A-Bout indoor green is capable of improving your putting stroke in the comfort of your own home. Traveling to the course can be time-consuming. Packing your gear and driving to the course can easily take hours out of your day. Setting up the Putt-A-Bout mat takes less than six seconds. Fuel costs can put your budget under pressure and the same goes for golf course fees. Opting for an indoor training aid can save you money. Over time you can save quite a lot. Have you ever gone on holiday and after a few days you start feeling bored? Do you wish you could go to a golf course but there isn’t one nearby? 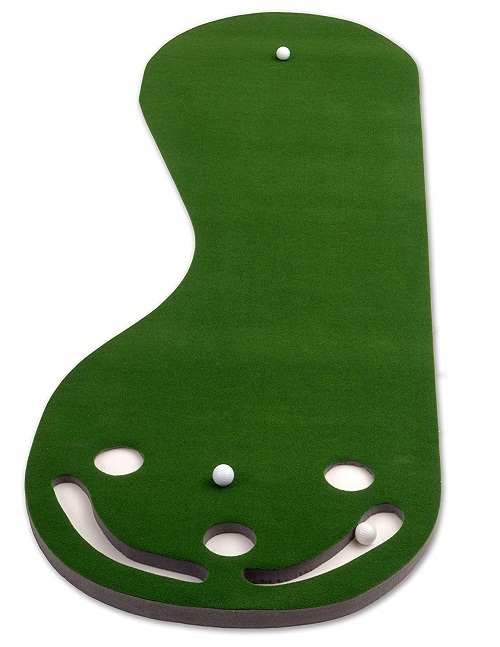 Now you can take your Putt-A-Bout Par Three Indoor Putting Green wherever you go. It’s soft and of a manageable size so the mat can fit into small storage spaces, even in your luggage when traveling. The Putt-A-Bout is so easy to set up and use that you can even let your children enjoy a game. It’s not heavy so little ones can carry it around. When the game needs to start all you have to do is roll the mat out and you’re ready to play. Everyone enjoys outdoor activities, especially when you want to perfect a sport you’re part of. But traveling to these outdoor destinations isn’t friendly on your fuel consumption. And let’s face it, some days you simply want to be at home AND enjoy your hobby. So, is there a way to practice your golf without having to travel? Of course there is! The Putt-A-Bout indoor putting green is the product for you.